Whether it’s developing a strategy for your marketing team or crafting a presentation for a client, Cacoo has a variety of templates to choose from for all of your professional needs. See for yourself. You can share your work with anyone—team members and clients alike—even if they don't have a Cacoo account. Send an entire folder or a specific Cacoo diagram using Edit and View-only links. Cacoo makes it easy to collaborate with your team anytime, anywhere. Edits are available to colleagues in real-time, and you can always leave comments for collaborators to review. Get the cloud-based diagram maker made for companies, teams, and you. 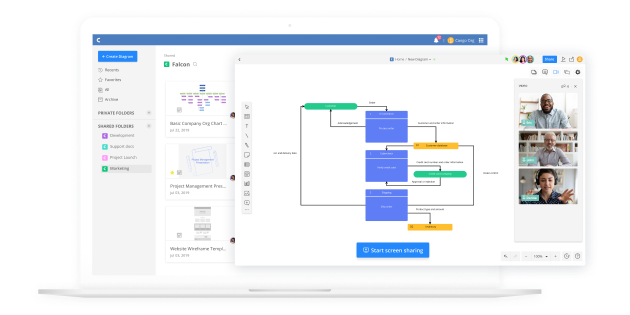 Engineers and developers use Cacoo every day to visualize complex ideas through informative diagrams, flowcharts, and more. Learn more here. Create visuals that take your team’s marketing strategy from start through execution. Learn more about how Marketers use Cacoo every day. Designing engaging visuals is easy for members of all skill levels with Cacoo. See how Product Managers and Design teams use Cacoo in support of their design processes. 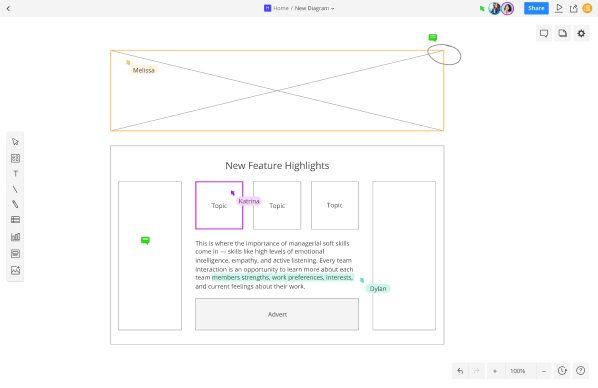 Keep everyone in the loop on big projects with diagrams that visually communicate. See how PMs use Cacoo to organize and deliver end goals. Cacoo is stacked with the most-wanted integrations, so you can get access to the things you need anytime. Try Cacoo for free, today.